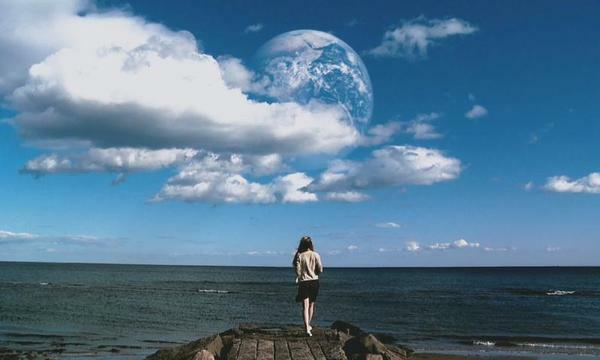 The question we all have as human beings is “what lies beyond our limit?” We just watched the film Another Earth where humans are faced with the perplexing realization that there is another earth mirroring our own, even another self completely synchronized with us. In reality, when we come into contact with other people, their inner being transcends us. They might let us into a few thoughts, but other than that, we will never fully know them. But to find another replicated self – would we recognize ourselves? Would that other self transcend us as well, as though we are looking at a stranger? Would you feel competitive of your other self? Would you find your other self ugly? Would you be annoyed by your other self? Would you love your other self? Would you tell your other self to get over all their hang-ups and get on with life? To embrace what lies beyond the limit, we talk of God in ways that we can understand from our experience of human relationships. When I say that I do not believe in the existence of God, I am saying that the belief of a creator and a ruler do not measure up in our current state of reality, or even within the context of the past and ancient history. He was the explanation that existed before we had a scientific explanation, used as a way to interpret people’s experiences. People desire to make sense of things, but the problem is, God does not make sense. I am in awe of our cosmic universe, so much so, that I find it impossible for our existence to be so limited by this idea of God. To me, we are looking too far out into the distance, when the answers all lie within us, within and beyond our massive and destructive home on earth. So there is no direct encounter and never will be – no way to interpret God outside of our own imaginings – in which case, God is actually a mirror of our own humanity – full of insecurities, the need for affirmation and praise, the desire to be close to these humans who are always so distant and cold, the desire to have their obedience, to incite dominance, to be in charge, to have control. Why does God mirror the fickle childishness of a human being? And if God is the creator, then who created him? The answer seems obvious – human beings created him. Lately, every time we see my parents, my mother has to make a comment about God’s existence. God is woven deeply within the fabric of my family. He is given praise for all the good things. The universe is over-simplified through Bible stories taken literally. My mom celebrates the day that she will “go to be with Jesus.” It’s not by my father’s intelligence and diligence in over forty years of hard work that brought them financial security. No, it’s God. The last time I wrote about religion, I was extremely angry for being raised without a choice. Writing is good therapy, and I’ve come to a new place of peace and acceptance. I feel released through my own realizations and views on life. But I’ve also chosen to keep those views separate from my family life. They have an idea of what I think. The problem is, no matter how much I bring it up, they will forget it, or write it off by tomorrow. My mom especially, has selective memory. She blocks out the things that she can’t handle. Especially since, according to their belief, I am “lost” – whatever that means. When I am with my family, I do my utmost to respect them. You cannot argue with a mind-set, culture, history, or the entire fabric of someone’s life. They will do anything to shut out conflicting views, to keep the cognitive dissonance at bay. Family is extremely important to me. So I hold hands with them when they pray, I smile and say nothing over the Jesus comments, I listen to my nieces simplify the world by stating the Bible as fact. In the meantime, I hope that as my nieces grow older, they begin to see that life isn’t so cut and dry. A universe that circulates around our own egos – that sounds like a man-made myth if ever I heard one. We are all in the struggle of existence whether we like it or not. We will all one day fall prey to death. We have no real control. I find this over and over in people who dedicate their lives to God. Life is just too much for them. They would like to whitewash all the realities that are too painful for them to take. It’s a coward’s way out. The older Christians in my life all believe that I will come back around. They were “wanderers” in their twenties and thirties, and are convinced that by forty or fifty, I will realize that my demise is nearing. There are too many things I cannot control. My body will start failing me, or friends will start dying off. I’ll be faced with the futility of my existence. I don’t think they understand, that I have already experienced all of those things. It seems to me, when people leave faith behind, they fail to search beyond faith. They avoid the question of spirituality altogether. Then eventually, they inevitably end up going back to what feels comfortable, to what they knew in their youth. My dad told me, “Never stop searching,” with his hands clasped tightly around my shoulders in a desperate attempt to get through to me. I replied, “I never will.” I wish I could please him, and be what he wants me to be, but I have to be myself. I will never go back to where I came from. I will move forward and live to the utmost before my body turns to dust. And believe it or not, I’m okay with that. You are currently reading How Belief In God Limits Us at Lauren J. Barnhart.